ACM tries to automatically renew your ACM certificates before they expire so that no action is required from you. Consult the following topics if you have trouble with Managed Renewal for ACM's Amazon-Issued Certificates. Your certificate must be associated with an AWS service that is integrated with ACM. For information about the resources that ACM supports, see Services Integrated with AWS Certificate Manager. ACM must be able to validate each domain name listed in your certificate. 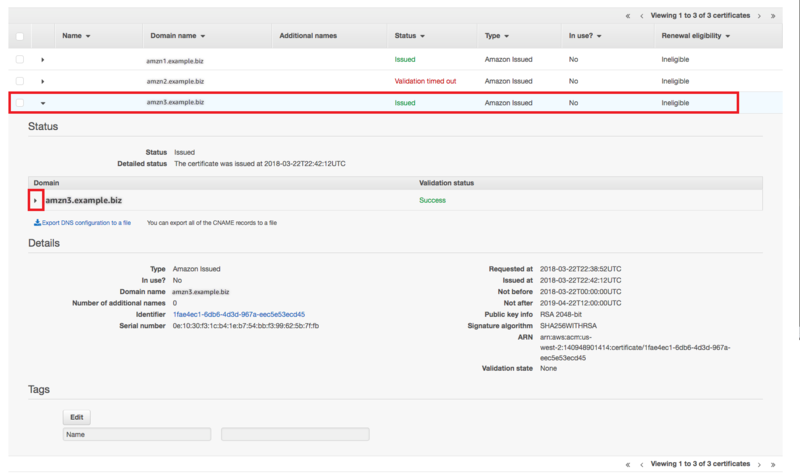 Configure the AWS resource that has your ACM certificate to accept HTTPS requests from the internet. Make sure that HTTPS requests to the domain names in your certificate are routed to the resource that has your certificate. Make sure that your DNS configuration contains the correct CNAME records. When a certificate is 60 days away from expiration, ACM automatically attempts to renew it every hour. If ACM is unable to renew the certificate after 15 days, you will receive an email with further instructions on how to manually fix the renewal problem. This process differs depending on how the certificate was originally validated. Email-validated certificates require domain validation every 825 days. In order to proceed with renewal, ACM sends an email for each domain name remaining in the PENDING_VALIDATION state. The domain owner or an authorized representative of the domain owner must take action to validate each domain name that failed validation. See Validate with Email for instructions on identifying which domains are in the PENDING_VALIDATION state and repeating the validation process for those domains. ACM does not attempt TLS validationg for DNS-validated certificates. 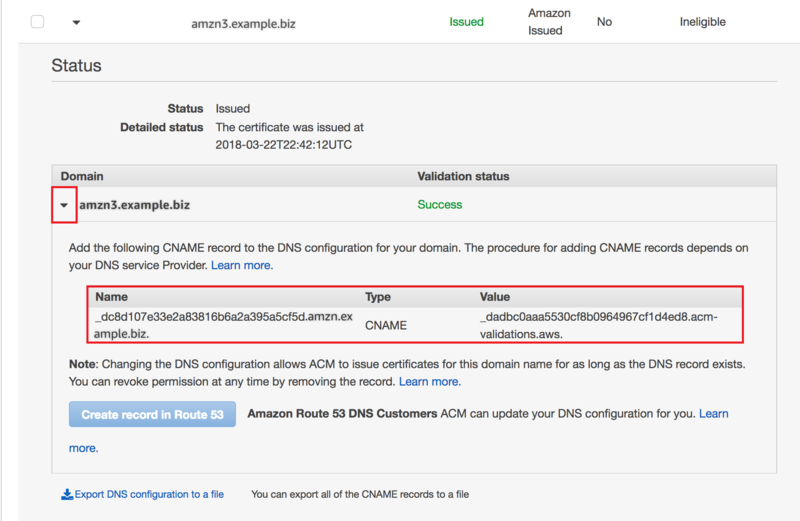 If ACM fails to renew a certificate you validated with DNS validation, it is most likely due to missing or inaccurate CNAME records in your DNS configuration. If this occurs, ACM notifies you that the certificate could not be renewed automatically. You must insert the correct CNAME records into your DNS database. You can find the CNAME records for your domains by expanding your certificate and its domain entries in the ACM console. Refer to the figures below for details. You can also retrieve CNAME records by using the DescribeCertificate operation in the ACM API or the describe-certificate command in the ACM CLI. For more information, see Use DNS to Validate Domain Ownership. Choose the target certificate from the console. Expand the certificate window to find the certificate's CNAME information. If the problem persists, contact the Support Center. Managed Renewal for ACM's Amazon-Issued Certificates is an asynchronous process. This means that the steps don't occur in immediate succession. After all domain names in an ACM certificate have been validated, there might be a delay before ACM obtains the new certificate. An additional delay can occur between the time when ACM obtains the renewed certificate and the time when that certificate is deployed to the AWS resources that use it. Therefore, changes to the certificate status can take up to several hours to appear in the console.